MIDGARDThe third generation of the popular precision current source, designed at M.I.T. 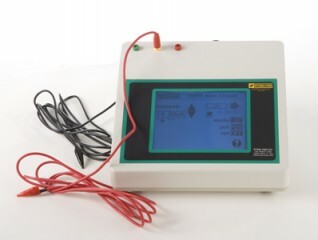 for the iontophoresis of neural transport tracers such as horseradish peroxidase (HRP) or tritiated amino acids into neural tissue, is now manufactured by Stoelting. It may also be used to make small lesions ; and in applications requiring precise current control through high impedance. The instrument is easy to use and reliable. The new Midgard features a higher compliance voltage (2000V) for injections from very small or partially clogged pipette tips. The output current level can be regulated to +/- 0.5% from 0.0 to 200Megohms. Pulpsed output helps avoid clogging or polarization of the tip of the pipette. The user may select pulsed or continuous current with a switch. The pulsed on/off times are factory set to 7 sec. on/7 sec. off, but can be separately controlled on an internal pot. Many users have requested external timing control for lab automation applications. The new Midgard can be gated through a BNC jack on the rear panel by any laboratory logic pulse generator. The output current is continuous whenever the gating jack is logic high, off when it is logic low. A special switch allows reversing polarity. This is useful when using a retaining current to hold the pipette contents in during approach. Two high voltage cables, a 200Megohm test resistor and user’s manual are included with each Precision Current Source. Load Current Rise Time Dependent on load resistance. Bremen, P., & Joris, P. X. (2013). Axonal recordings from medial superior olive neurons obtained from the lateral lemniscus of the chinchilla (Chinchilla laniger). J Neurosci, 33(44), 17506-17518.